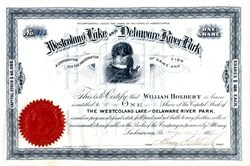 Beautiful certificate from the Westcolang Lake and Delaware River Park issued in 1887. This historic document was printed by J. Ottmann and has an ornate border around it with a vignette of a hunting dog with a duck in mouth. This item has the signatures of the Company's President, Henry E. Clough and is over 129 years old. A number of well-known professional men of New Jersey and Pennsylvania have organized a new sporting club to be known as the Westcolong Lake and Delaware River Park Association. The club has purchased a tract of land five miles long and two wide, containing 4,500 acres in the heart of Pike County. A club-house is to be erected and the estate kept as a game preserve and private park. Westcolong Lake, noted for its line pickerel fishing, is in the centre of the park, while black bear, wildcats, foxes, ruffed grouse and other game abound. The officers of the new association are: President, Mr. Henry E. Clough; vice-president, Dr. E. A. Maxwell: treasurer, Wm. Holbert; clerk and secretary, W. P. Holly; counsel, C. W. Cull.